10 things I can see from my favorite knitting spot. …the hardest thing about carole’s prompt this week is identifying my favorite knitting spot. a quick review of my flickr stream shows knitting all over the place! at my kitchen table, at my desk, in my living room, at starbucks, at friends’ houses, at cast-on cottage. even central park (that one was very fun). all of these are wonderful places to knit and depending on what I’m knitting, some are better than others. knitting lace? hands down my kitchen table where I can have the chart handy in front of me (and where I can concentrate without too much distraction). knitting a sweater? love my living room chair because it’s big and sweaters can get big when they’re close to being done. I do love knitting lace and knitting sweaters, but what I really love is knitting with others. and I think my favorite place for that is cast-on cottage. especially on friday afternoons. a friday afternoon back in september. originally blogged here. 2. other people’s projects – always inspiring. 3. yarn – ditto the inspiration. and the colors – it always makes me happy to look at yarn! 4. patterns – there is always something new out on the table, a magazine, a book, and it’s rare we don’t get excited about a new project at some point. 5. starbucks. yep, there is one right next door and many of us – me included – always stop by the drive-thru on our way in. I think the best thing about this week's topic . . . is seeing that nearly every knitting place . . . is a happy place! Love your list. I had a feeling you would choose this as your favorite knitting spot. Your list shows all the reasons why! Carole is more astute than I am! I never even thought about CoC as a favorite place to knit. But it is that! Great list! I wouldn't have thought about my local knitting shop as a favorite, but it is. Just for exactly the things you mentioned. What a great picture and of course everyone is happy! all the great things that go along with knitting. great list! and i love that you had to ~narrow~ down your list of knitting spots. 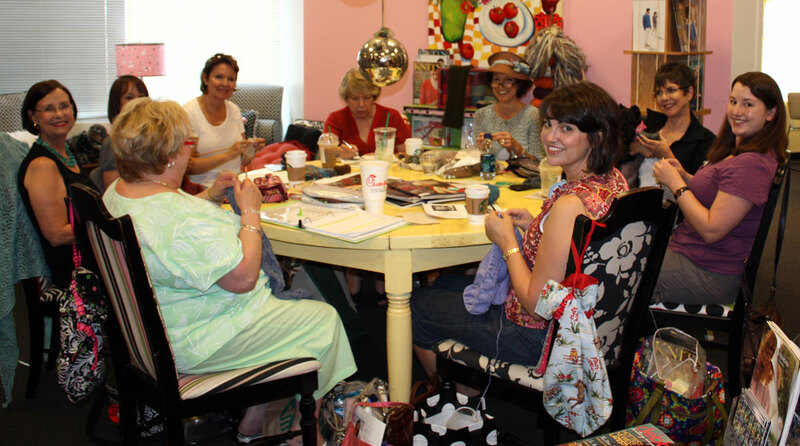 heaven: knitting among and with friends.